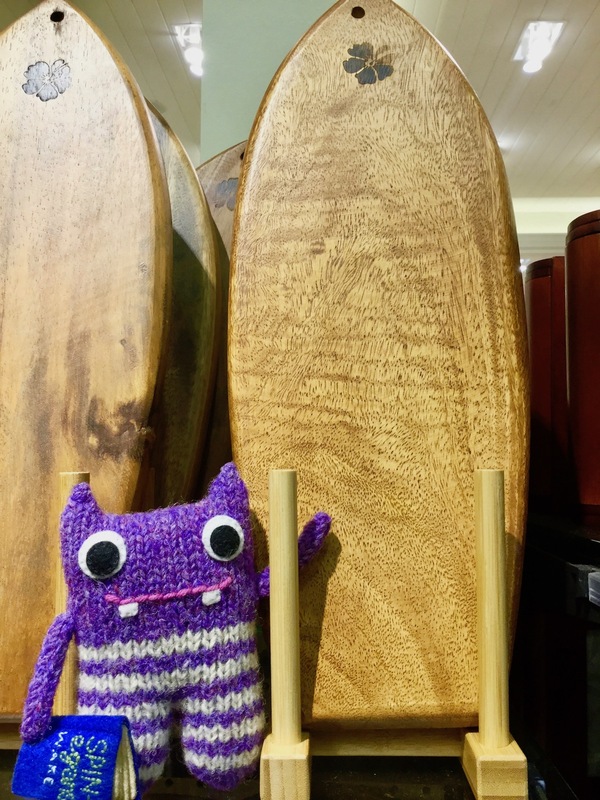 Other possible titles for this blog post: Why You Shouldn’t Take a Monster Shopping, Monster Maui Mayhem at the Mercantile, or Souvenir Shopping Takes a Beastie Turn. Either way, you know you’re in for some fun when you hit the aisles with Finn Mc Spool and a camera in tow. And in case you’re wondering what an ABC Store might be, let me try to sum them up. First off, they are EVERYWHERE in Hawaii (there’s also a few in Marianas and Las Vegas, go figure). And I do mean EVERYWHERE. I’m not exaggerating when I say one street in Maui (in the town of Lahaina which I’ll get to next week) has something like four ABC Stores within less than a mile. 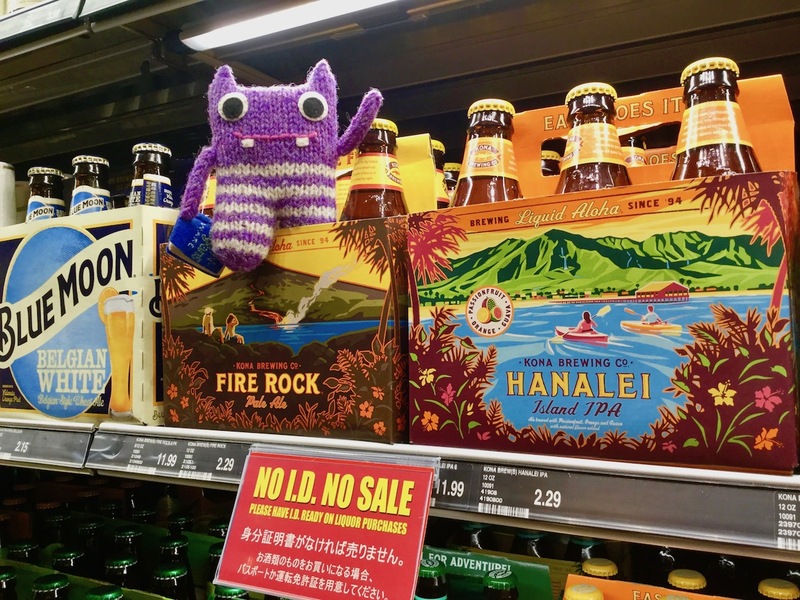 The stores (originally named Mister K) were started in 1964 in Waikiki by the Hawaiian born Sidney Kosasa and have been thriving since with everything from fashion to food, and souvenirs to sunscreen. But little did they know that a monster was heading their way to have some fun with their displays! 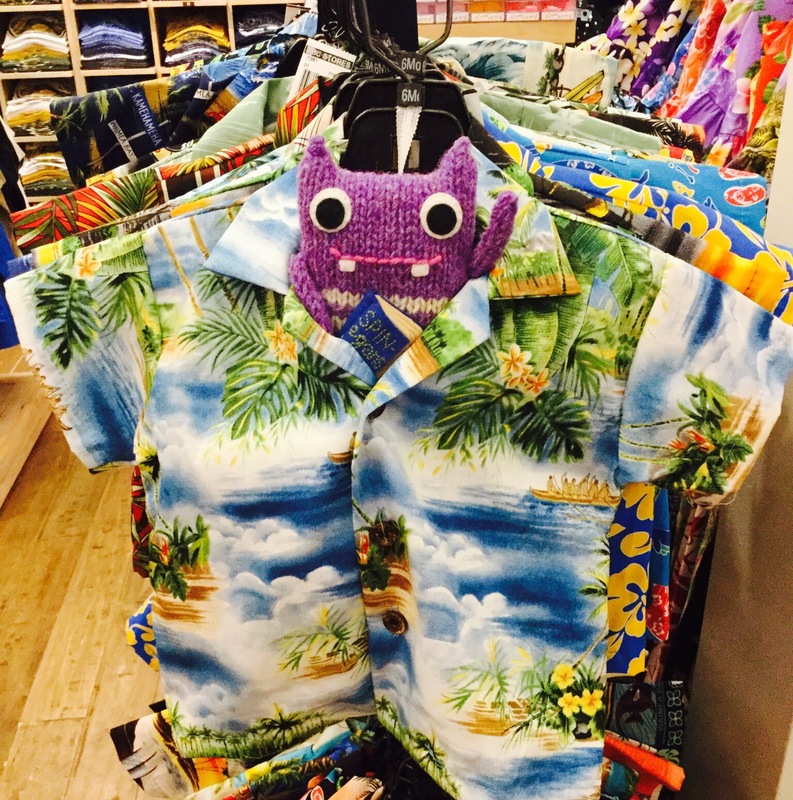 You’ve already seen that Finn was getting into the aloha spirit with a garish Hawaiian shirt that was thankfully a little too big for him. 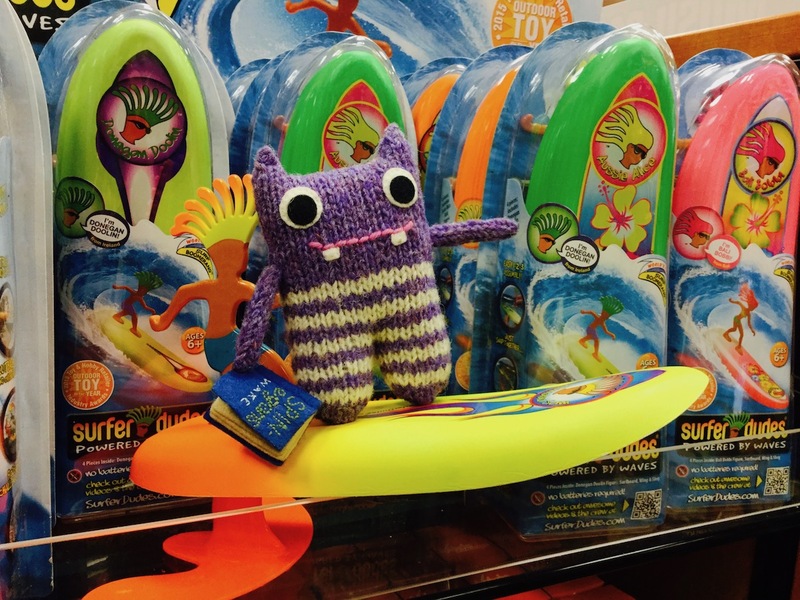 Since the shirts weren’t his size, he thought perhaps he could tap into Hawaiian culture by getting a surf board. 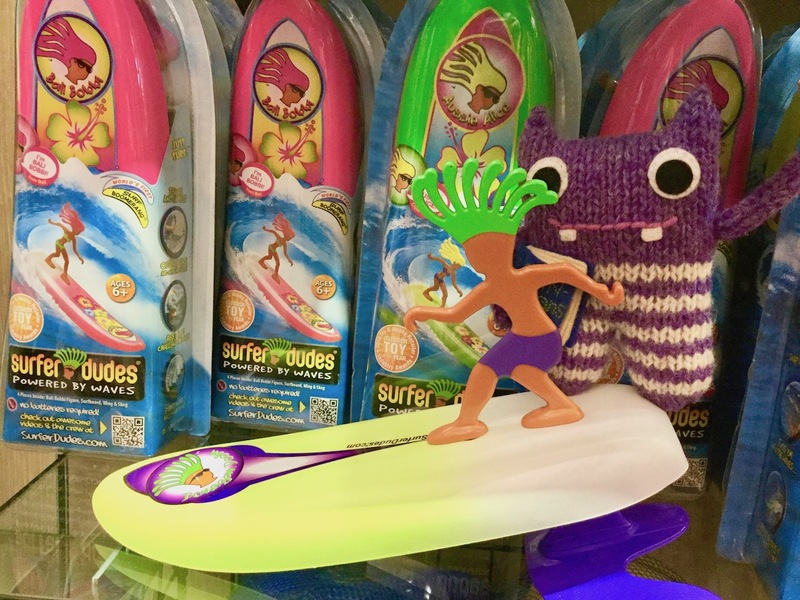 I didn’t have the heart to tell him those were just cutting boards, but I did suggest he first take a surfing lesson before committing to buying his own board. Finn was off and running saying he knew EXACTLY where he could find a teacher. He was a little timid at first (and throwing the board way off balance by standing on the very end)…. …but within little time he’d gained some confidence and was ready to “shred some gnarly waves” (his words, not mine). While Finn was hanging ten, I made the mistake of turning my back for a moment. When I came back to find him, he was gone. It only took a little knowledge of Beastie preferences to guess what section of the store he might have gotten off to. 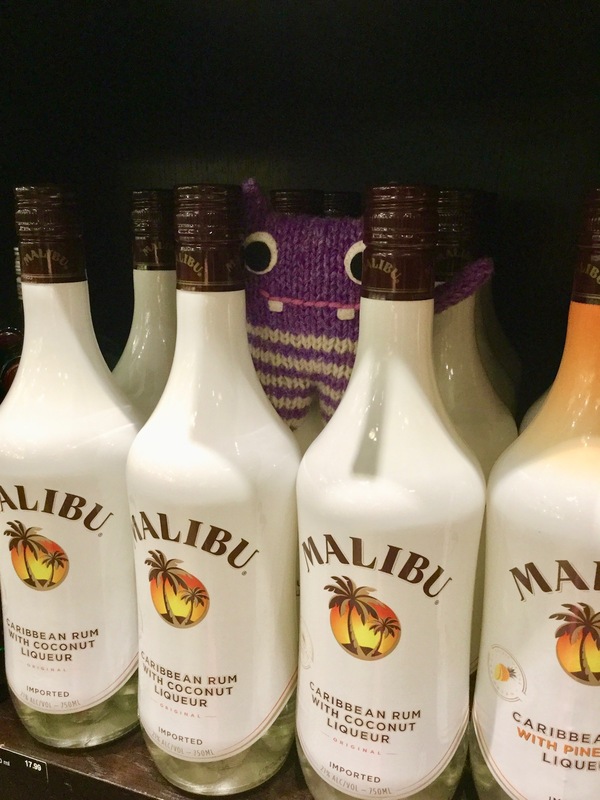 The problem with giving a monster alcohol is that they tend to get very friendly and gregarious. Soon, Finn was chatting up one of the local ladies. At first I thought a little island romance may have been going on, but then I remembered I’d promised Finn a grass skirt so he could be properly dressed for his hula lessons. Turns out he was just asking her what section of the store she found hers at and if she thought they might have his size. 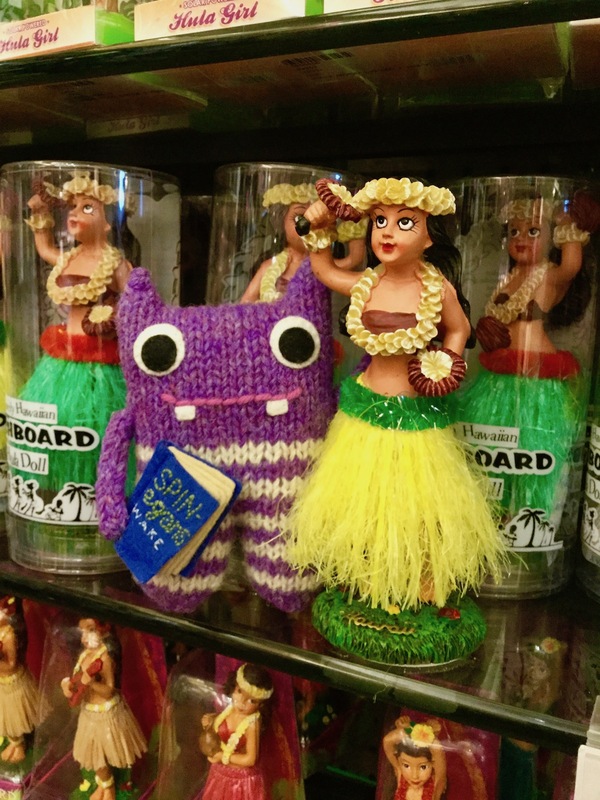 He was a little miffed when all she did was maintain her glassy-eyed stare to the heavens and sway her hips as if taunting him with her Hawaiian hula fashion, so he said his goodbyes and we went to check out before we got kicked out of the store. 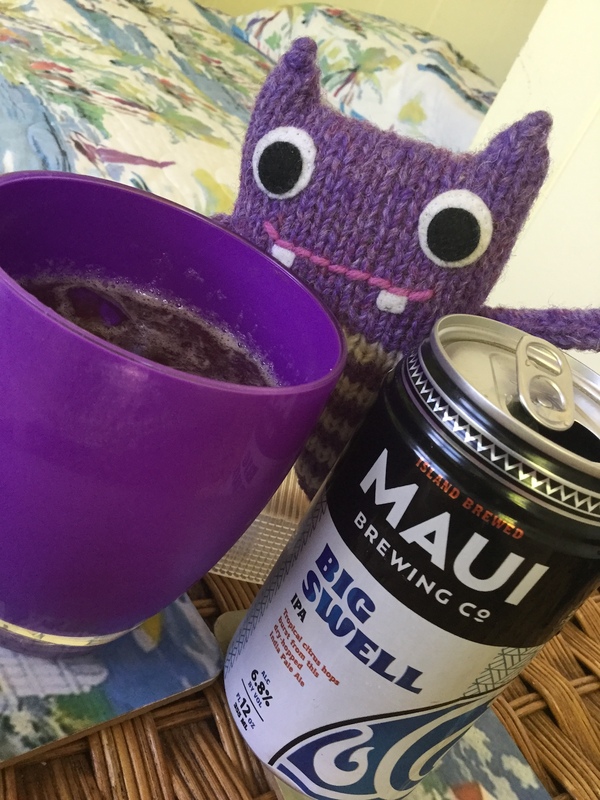 When we got back home, we enjoyed a tasty, locally-brewed refreshment…in a color-coordinated cup, no less. Finn was wondering if maybe he’d had too much sun or too much beer when he saw “some velociraptors” out in the garden. –No, Finn, those are chickens. -Not after drinking. I think there’s laws against that. -So what are they good for? -Remember how expensive the food at the store was? -The chickens STEAL food for us!? Clever chickens!! -No, Finn, they provide food. -They’re kind of cute. I’m not sure I want to eat them. 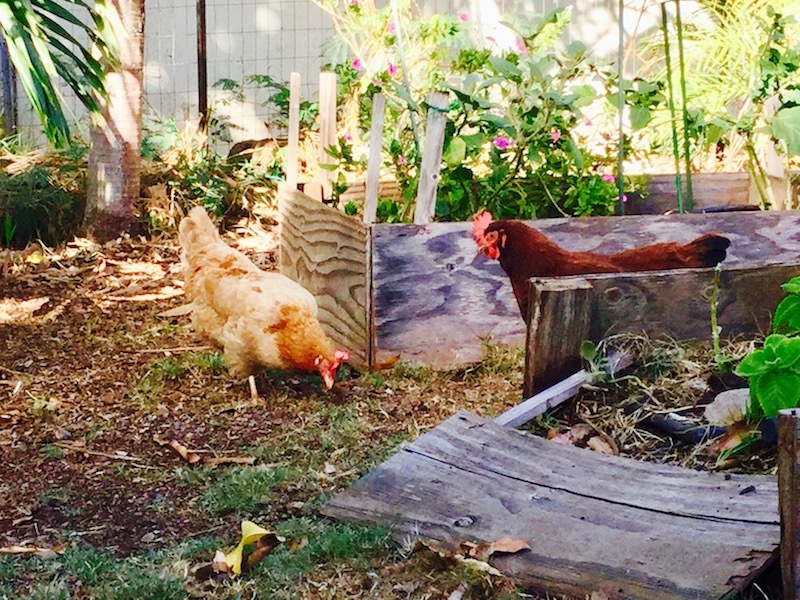 After a little explanation of where eggs come from (Finn was disgusted at first to learn EXACTLY where they came from), we thought it was a good time to stock the pantry with a trip through our rental house’s garden. 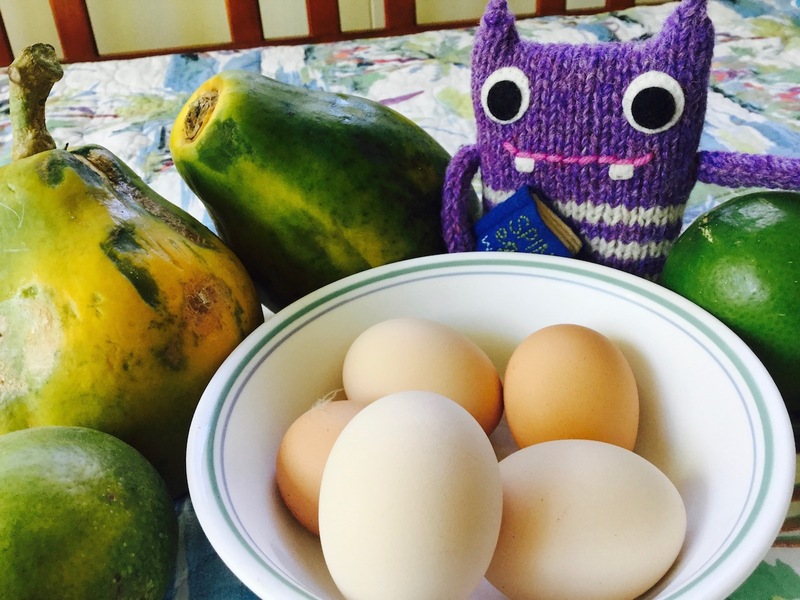 I have to say, Finn brought in a good haul of eggs, papayas, and limes…and managed to not get attacked by the hens. Thanks for stopping by, everyone! Any shopping- or chicken-related adventures for you lately? As mentioned already, Finn will be back next week with a trip into the town of Lahaina, and I’ll be back next Wednesday with more book news! The Maze: Book Three of the Osteria Chronicles is coming out soon! If you want to catch up on the series, be sure to enter to win a copy of The Trials of Hercules (Book One) via my Goodreads Giveaway, or pick up a copy for only 99 cents by using coupon code HW93X at Smashwords! I’m about to go enjoy a tasty, locally-brewed refreshment myself. Maybe I’ll spot Finn there! At least having him around keeps me from having to enjoy my refreshments alone! 😜😜 enjoy! It was a tasty brew. Unfortunately it had disappeared (evaporation? Beastie?) by the time the omelette was ready. And another misfortune of the holiday was that Finn never did get a grass skirt. First, there was no real grass to speak of for simple skirt creation; second, my weaving skills weren’t good enough to work the palm tree fronds I found into anything more than a Beastie-sized loin cloth. For some reason, even though he runs around naked most of the time, Finn refused to be seen in handmade “Tarzan underpants” as he called them. I think our next trip to Hawaii might be to the Big Island to see the volcano, so maybe (just maybe) a grass skirt wouldn’t be the smartest fashion accessory. Ziplock baggies are probably a fashion don’t as well in that case. I see some fumbling with aluminum foil to make some Beastie moon boots in my future! Now that you mention it, I do remember that adventure! So, that means hooded capes and scythes are proper volcano attire. I’ll keep that in mind for my own packing list…not sure how to explain the scythe to TSA, but…. I bet they’d still question the felt one. The TSA can be sooooo picky. I love following the adventures of Finn! He loves having them…I just wish he’d pay for his own plane ticket once in a while. Haha mmmm I could get behind that meal plan! Speaking of Finn and his reading, I have been surreptitiously (probably not, I’m probably super obvious) reading the sample from ‘The Maze’ at work today–I love it! Your Dad is right, it does remind me of ‘A Song of Fire and Ice’. I suddenly got nervous that I might spoil the first 2 books if I kept on reading all 6 chapters, so I made the tough decision to STOP reading and get on that book ordering bandwagon pronto! Ah, then you’ll be able to read through Chapter Three without too many spoilers.